It was a lengthy drive to Disneyland from the city we were staying in, so I enjoyed a chocolate shake and a packet of cookies during the commute. Once through all the shuttles and security, we started out at California Adventure. I skipped the Soaring ride (I get a little extra queasy on it) and enjoyed my chili and the banana. This helped keep me full since I had been up for quite a few hours at this point in the morning and I could eat the entree without feeling watchful eyes of coworkers, most of whom did not know about HMR. A little bit later in the morning while my friends enjoyed soft serves and root beer floats, I ordered a Diet Coke and poured it into my shaker bottle. I added a vanilla shake and had my own Diet Coke Float! (Note I shake in the Blender Bottle carefully but then slowly unscrew the lid to release the carbonation rather than pop open the top which causes liquids to fly!). After traversing California Adventure including riding Guardians of the Galaxy (oofta that one shook me up! ), we went over to the Magic Kingdom to grab a Fast Pass for Space Mountain and to have lunch. My friends grabbed pizza in Tomorrowland while I grabbed a plain side salad. I topped it with my Walden Farms dressing and donated the high-calorie dressing to my friends to dip their breadsticks in. Once I finished my salad, I ate my two cups of grapes. I don’t eat a lot of grapes because of the sugar content (they are really sweet to me) but there is something to be said for keeping your hands busy with those little buggers. I also enjoyed sipping on a diet lemonade. Then we were off to the Matterhorn and then on to Adventureland. At this point in the day it was getting quite warm. I grabbed some fresh mango after we rode the Jungle Cruise to enjoy while in line for Haunted Mansion. It was delicious topped with some Tajin. The line was about an hour, so I finished off my second serving of cookies as well. After the Haunted Mansion, my friends wanted to get Dole Whip. I wasn’t super hungry but I did feel tempted as it was close to when I would normally eat dinner (but we still had many hours left in the park)… so I ordered a fresh pineapple spear. At this point I was quite full. Some shows, some more rides, and then we had just an hour left before we left to go back to our hotel. There was a pizza party when we got back to the hotel and some of my coworkers wanted to get a real meal instead of the pizza. So we left the park in search of food. I enjoyed a massive spicy fruit salad at a restaurant in Downtown Disney as well as my 5 Bean entree. On the bus ride home, shortly before heading into the pizza party, I ended my day of dining with my chocolate Benefit Bar. This special treat left a sweet chocolate taste in my mouth and was the perfect topper to keep me full while in a room full of one of my favorite foods. I didn’t end up going to bed until about midnight, so it was an incredibly long day. However I stayed in the box (and walked almost 22,000 steps!) which helped keep me motivated to stay in the box during the remainder of the trip. Have you been to a theme park while in Phase One? Would love to hear how you stayed in the box during your visit! Apologies on the delay! The race was fabulous and then it was back home to teach all week followed by another weekend of races. But more on those later. First the spoiler… I FINISHED THE RACE! And I finished in under two hours and twenty-seven minutes! That’s the short version. 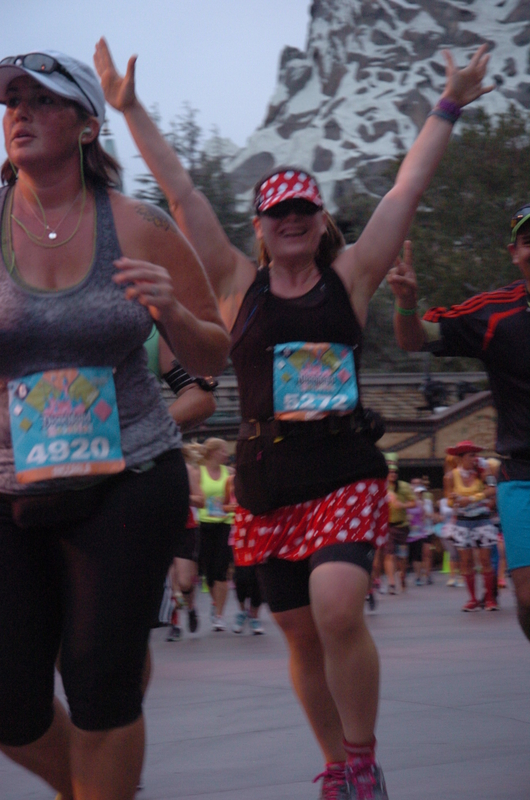 Below is a much longer accounting of my experience of the 2014 Disneyland Half Marathon weekend. I spent a lot of time anticipating this race. I signed up for it in January, before I could even run a mile. And then spent seven long months learning to love running. For those of you who may not know, I attempted this whole “running” thing in 2009. I made it a goal to finish a half-marathon. I worked a little but never really committed to training. I did intervals, which was necessary for my body at the time. I was about 60 pounds heavier than I was for this race when I set my personal best in December of 2009. My time to beat would become 3:19:50 and it would stay that way until August 2014. Shortly after the half in 2009, I injured myself. And spent most of 2010 recovering from multiple injuries which spiraled into never really getting into running again. Until I signed up for this race. The race was at 5:30am on the Sunday morning of Labor Day Weekend. I had been preparing for the early start by going to bed earlier and waking up earlier all week. I even continued the trend by waking up early on Saturday and cheering on the 10k runners as they ran past my hotel! Stole my husband’s chEAR noisemaker while he slept! We spent the Saturday in the park. I had read you should try to stay off your feet the day before a long race but I wanted to enjoy all the weekend had to offer. Which included riding Cars for the first time and doing multiple trips on California Screamin! As the sun rose overhead and things started to get extra hot in the park, we headed back to our hotel where I enjoyed some HMR Chicken Pasta Parm and bananas. I ate a LOT of bananas over the weekend and not just the free ones in the concierge lounge! Then I took a nap. Which ended up happening until about 8pm when I woke up, laid out everything for race morning, and went back to sleep! It’s a good thing I went to bed early because I was awake before my 2am alarm even sounded! I got dressed in my finery and ate my HMR oatmeal and drank 8 ounces of Via coffee at room temp because, well, the water in my water bottle was room temp? Obligatory hotel room selfie at 2:45am! 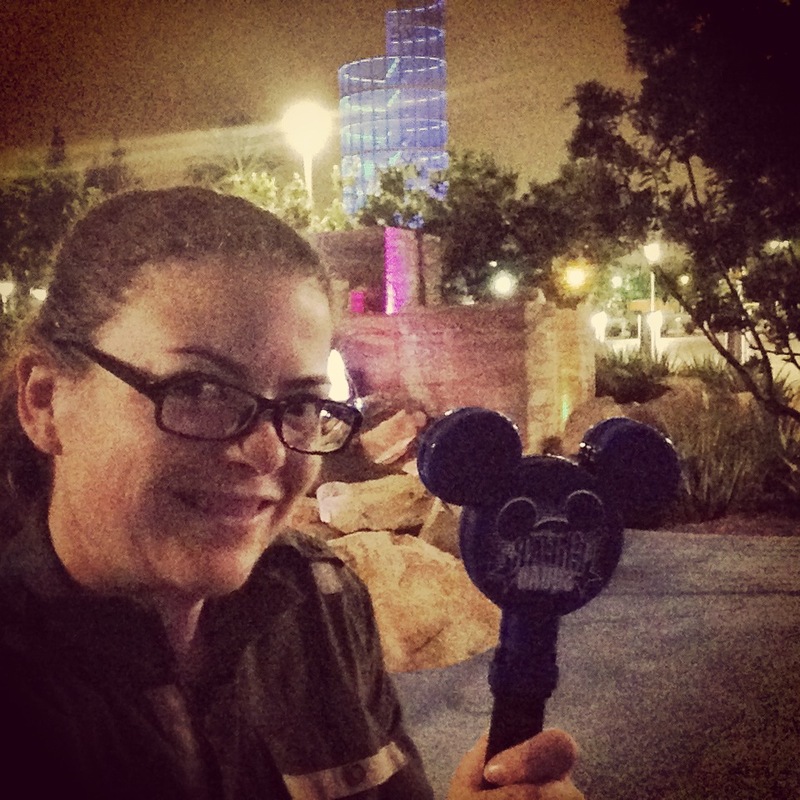 After nervously dancing quietly around the room and making sure I had everything I needed, I woke up my husband to drive over to the Disneyland Hotel where we would park the car and head to the start. It was 3:15am and parking opened at 3:30 and I am never one to be late! My husband had not gone to bed early so he was probably a bit cranky but I don’t think I even noticed! We got to the hotel, hit up the lobby bathrooms, and then wandered around near the finish line. I met up with some Team #runDisney folks for a group photo and at about 4:40am, headed to my starting corral (with a quick portapotty stop on the way!). Once I got to corral H, I knew I was in for a wait. We had about 30 minutes at that point until the sent the first corral off, but my corral wouldn’t start until 33 minutes later. I was a bit cranky with my corral placement going into the race because all of the earlier corrals had finishing times no greater than 15 minutes apart. Corral H had finishing times from 2:30 to 3:15 and of course my 10k in late May had me finishing right at 2:31. The secret I learned is that everyone pushes to the front of the corral, especially if you are anticipating being slower, so you can stop for photos without being swept. I had no desire to stop for photos (they have professionals!) 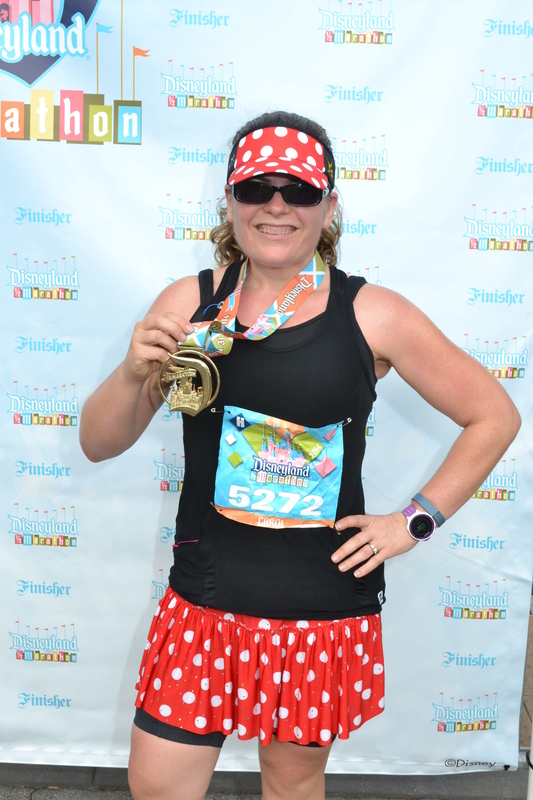 and I could do character stops at some of my later Disney races — my goal was to stay strong and give the race my best, and I was worried I would spend forever dodging folks (I would later make peace with the dodging as I started at the front of corral H only to catch up to and dodge folks from earlier corrals). 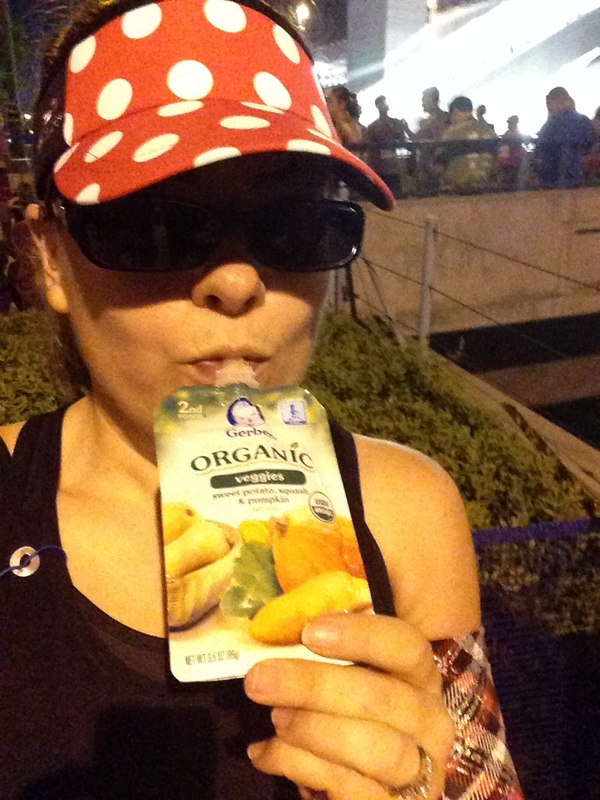 While waiting in the corral, I got my last bit of pre-race fuel in! That’s right. I stayed in the Healthy Solutions box all weekend, including my race fuel! Yum. Pureed fruits and veggies! The start was less thrilling than I imagined. I had read so much about Disney races where they set fireworks off for each corral. But that didn’t happen at Disneyland. And there was so much chatter from the hosts, I didn’t have time to get excited. Instead I just wanted the host to stop talking and let me run already! The course itself ran outside the perimeter of California Adventure before turning into the back driveway of the park. It was there I saw the mile 12 sign. I joked out loud that we only had one more mile. Yeah that went over really well. I blame the “almost there” guy hehe. There were bands all along the course, including in the back lots of California Adventure. 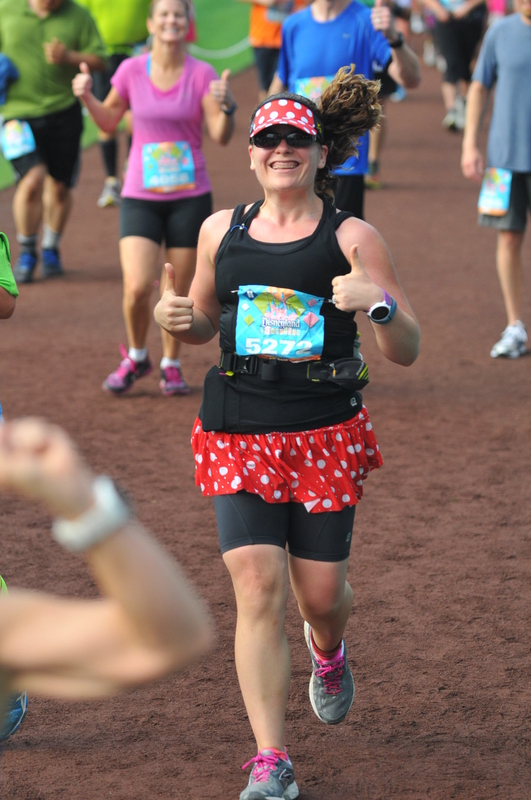 I love the live music – never needed my headphones (which stayed tucked away for the whole race) between the attractions, spectators, and live music! From the back road we entered the park. I expected it to be crowded through the whole race and I was not let down by that expectation. 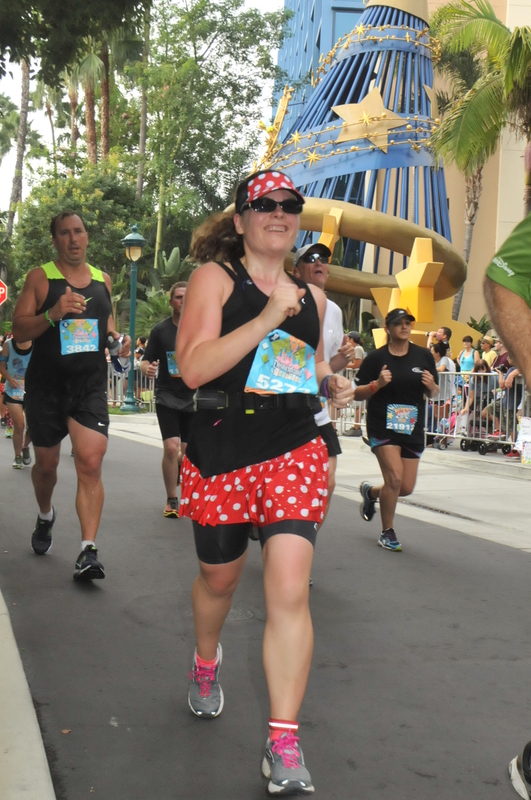 I have no photos from California Adventure because runners without manners were running crazy diagonals and hopping in front of all of the cameras. Literally jumping. Like stopping suddenly and jumping in the air. Next time I am just running into them. I saw someone else run into people stopping suddenly to pose for cameras. It’s not safe! I am all about walkers and I am all about people having fun. I get it. But it’s absolutely inconsiderate and UNSAFE to stop suddenly without looking around or to dart in front of people just to mug for the camera. 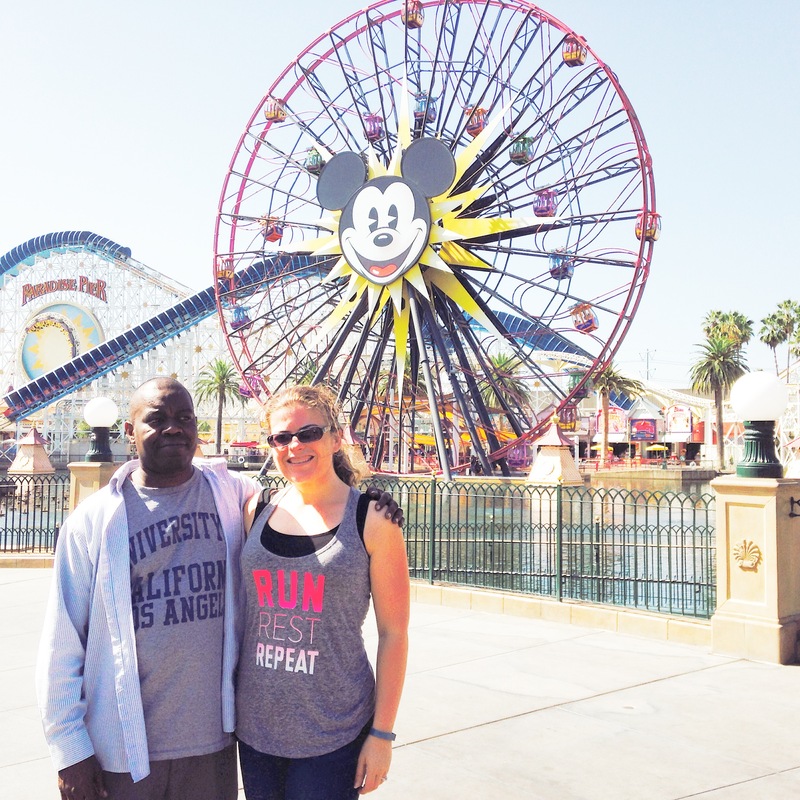 We ran through most of California Adventure which was super cool since I had been there with my husband the day before. My arms were starting to get warm as the sun rose and I knew my husband would be cheering along Main Street USA, so I took of my arm sleeves which were dripping wet at that point. The area between the two parks was a super narrow path and both sides were slammed with spectators. It was crazy! I remembered reading the pacer guide which warned runners to not speed up from the thrill of the experience in those first miles and so I kept reminding myself to SLOW DOWN, enjoy the experience, run negative splits later when the course opened up more. 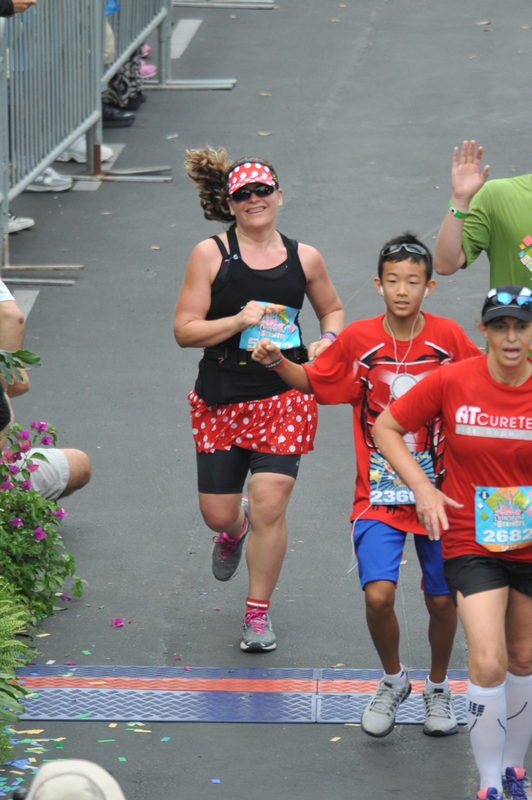 Seeing my husband along the course gave me a whole new shot of energy. 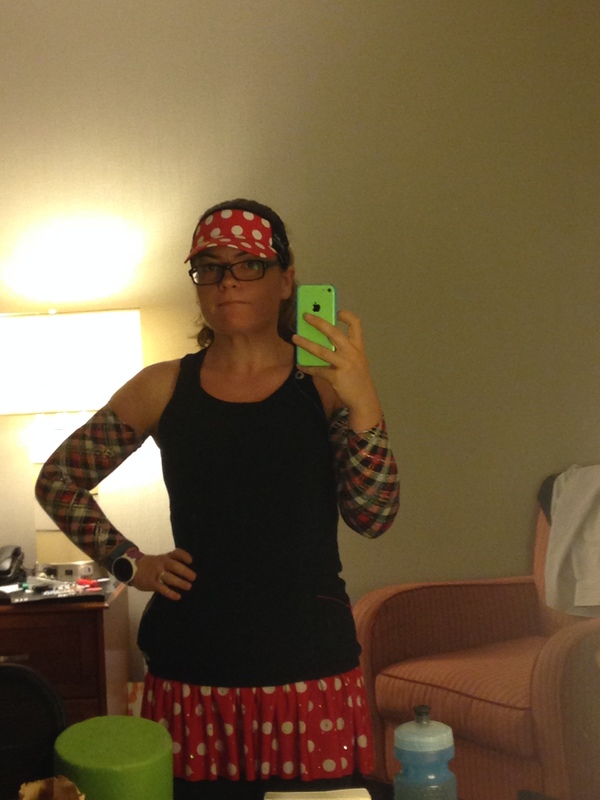 I ran over, gave him a kiss, and handed off my dripping arm sleeves to a confused yet amused husband who would wander around after I passed and pick up a couple thousand steps during the race. Disneyland itself was a neat experience. Although I had run through it for the 5k in 2009, it was still a fun experience. This is the part most people enjoy the most. However there weren’t many spectators outside of the employees (who were very very sweet) and I didn’t feel the same energy I feel running the city streets or along nature trails. It was a little weird but not in a bad way. I also think I still had a bad taste in my mouth from the negative experiences running in California Adventure which I tried to shake off for the next couple of miles. Once we hit the streets of Anaheim, I felt myself getting my groove back. The streets opened up and there were still so many people along the course. It was super cool to see locals and tourists turn out with signs both for specific people but also for runners-at-large! There were huge crowds of spectators in the baseball stadium parking lot! 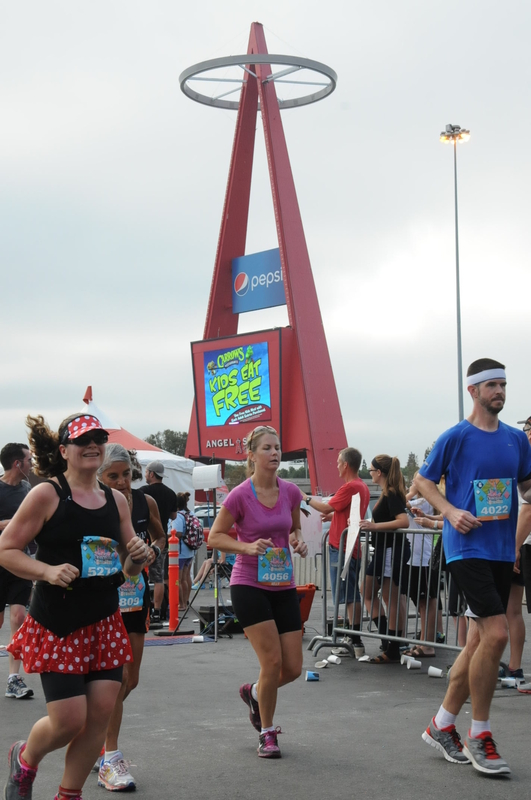 One of the highlights for me was running through the stadium where the Anaheim Angels play. I had been there for a game with my husband a few years ago, so I was somewhat familiar with the park. But it was a whole new experience to get to run the field and even cooler that the stands were filled with cheering spectators! The crowds are roaring in Angel Stadium! 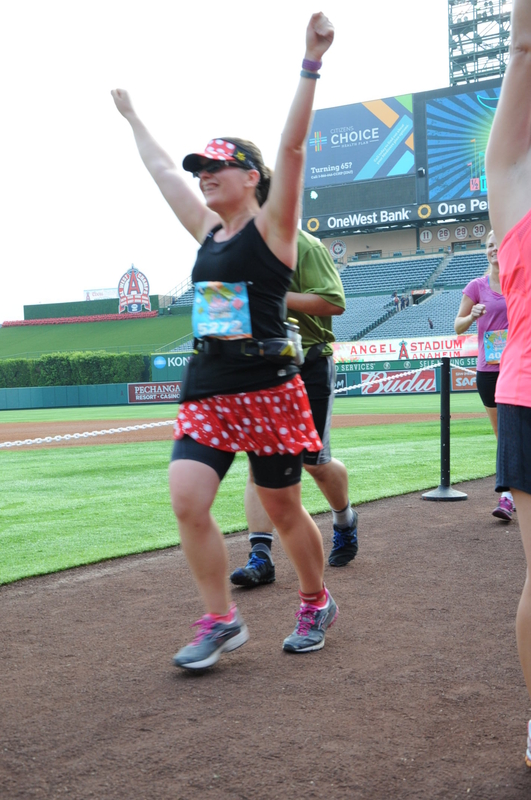 I purchase videos from MarathonFoto which included one of my running past the first base dugout. However I wish it included the audio when I was exiting. The announcer was saying that when we exited the stadium we only had… and then the entire audience in the stadium yelled “THREE MORE MILES!!!! !” I WAS PUMPED! The last three miles were probably the hardest. I had stuck to my pacing and fueling plans and was on target to beat my practice half time which was slightly over 2:28. I hadn’t gone into this race with the intention of beating the practice time because I knew the course would be crowded and I just wanted to enjoy the race. But with three miles left and open streets ahead, I knew I no longer had an excuse. But those last few miles is where the crowds thinned and my energy wained. I took my third banana-squash Gerber (fourth for the day if you count the one in the corral) and allowed myself to walk the water stations a little longer than before. That last mile seemed to go on forever. Part of it was a repeat of the back lot of California Adventure and then through Downtown Disney. The crowds picked up again and my energy picked up as well. I can see the finish line ahead! When I could finally see the finish line, I picked up my pace. I lengthen my stride and really pushed that finishing kick. I knew I could beat my goal and now there was an incentive to get that time as low as I could. The crowds were cheering and apparently I still had fuel in the tank! Remember how I mentioned people should look behind them? Well I crossed that finish line pushing my legs as hard and as fast as I could. Except now I needed room to slow down… so I shot for the opening I saw along the finish. In the end, I finished. I finished faster and stronger than I ever dreamed. I am a runner. I am strong. I am healthy. And I have never been more grateful in my life of all of those who have supported me through this journey. On November 13, 2013, I started the HMR Diet. Walking quickly left me out of breath and running was out of the question. 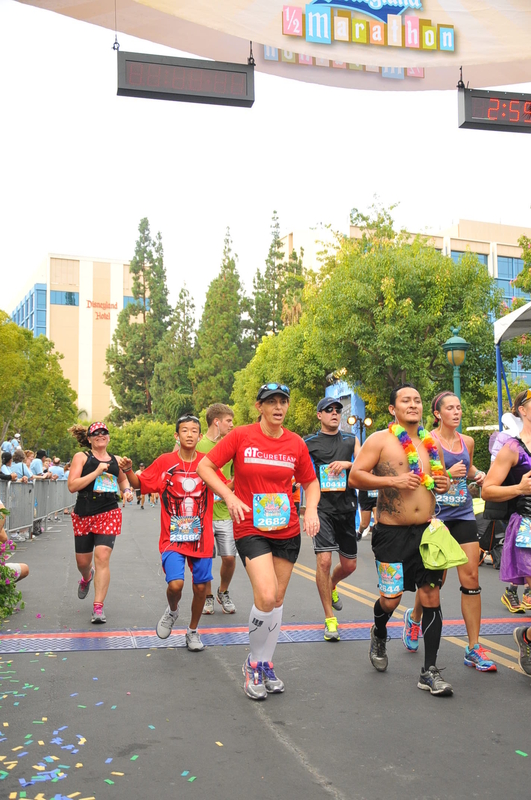 On January 28th, 2014, I logged on to Facebook during my lunch break and saw on Facebook that the Disneyland Half Marathon was 90% full after only opening a couple of hours earlier. I had not yet run a full mile. “I arrived early for a class and thought… Wonder if I could run a mile before class? Since that email, I have run a lot of miles have gotten faster in the process. I broke the 30 minute mark for my 5k time and continued to shave down my 10k time. I even completed a local half marathon two weeks ago as a last minute replacement for my long run that weekend and got below the magical 2:30 I had dreamed of breaking. Yet completing that half marathon seemed easy, I signed up for it knowing I could run it. Disneyland is a different beast. I committed to this race based solely on the belief I could someday do it. That my body, which could not run one mile, would be able to last for 13.1 miles. That I wouldn’t fall off course over the 8 months leading up to the race. It took serious faith in myself to commit. And a commitment to myself to train and fuel properly. I don’t know what race day will bring. I don’t know if I will PR but that’s not my goal this Sunday. I am doing this to celebrate my journey. To celebrate my commitment to myself. To celebrate the trust I had in my ability to continue the journey to this moment. Do you want to celebrate and follow along on the journey with me? My bib is 5272 and I invite you to celebrate virtually by signing up for runner tracking. Having faith in yourself and in the process can take you to amazing places and help you achieve things you didn’t think were possible. I will be running 13.1 miles on Sunday and I can’t wait! During my 34 weeks on the HMR Decision Free diet, I have traveled more than the average American. And while some of it has been for fun, the majority has been work related and thus relatively regimented. So when I decided to visit my sister for a week in Florida and we decided to spend three of those days in the land of Disney, I got a little anxious about staying in the box. First, a spoiler, I survived! However I thought it would be helpful to write about my experience for others and also as a reminder to myself for future trips. “Guests with food allergies or intolerances are allowed to bring food into Walt Disney World theme parks and dining locations. When entering a park, simply inform the Security at bag check that someone in the party has a food allergy or intolerance. Guests staying at a Disney Resort hotel who have items that need to be refrigerated should ask the Front Desk to have a refrigerator placed in the room, subject to availability. An additional charge may apply. I had no issues with Security and didn’t even need to inform them about the food I was bringing in, they must see a lot of things come through. Before we left, I baked both savory and sweet HMR mini muffins using the oatmeals, soups and 70 shakes. You can find some of my recipes here. I portioned them out into individual servings that were equivalent of a half a shake for me and a full shake for my Healthy Solutions at Home sister. We also each packed an entree that could be enjoyed cold (Five Bean casserole! ), several types of sugar free gum, and a sandwich baggie full of various water flavor squeeze-ins like Crystal Light Liquid (mmmm Sangria and Strawberry Lemonade!) and Dasani Drops (Cherry Pomegranate FTW). The gum and water flavorings allowed us to change up flavors we were experiencing without increasing our caloric intake. 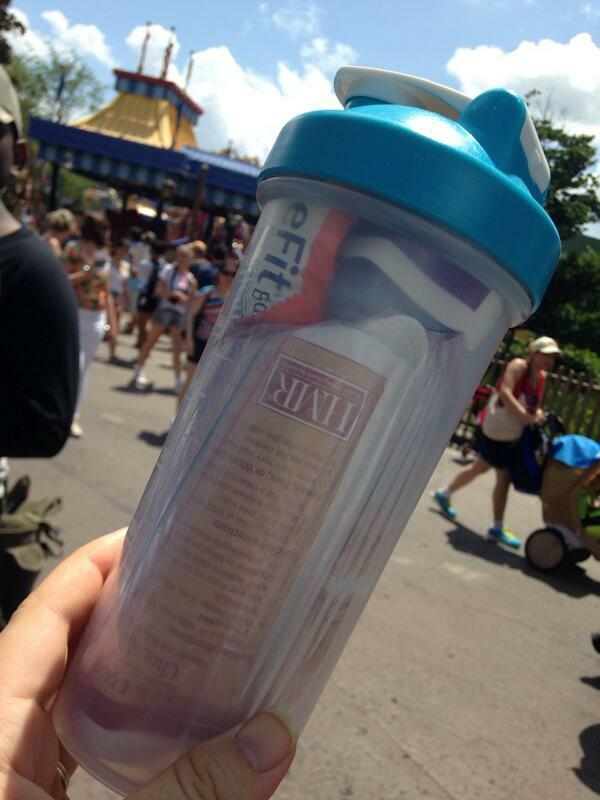 Next, we each packed an empty water bottle to refill throughout the park. We quickly learned you could walk up to vendors who had fountain drink machines and request cups of ice water for free! We would fill up our water bottles with refreshing cold water and play with flavorings. We also purchased various diet sodas and unsweetened iced teas when we wanted a special treat. The secrets for me were front-loading and keeping myself occupied. I ate an entree before we left in the morning and drank a giant bottle of water. Then I made sure to always have a low calorie beverage in my hand (yay iced water!) so that I could drink whenever I was tempted with food. And I won’t lie… I was tempted! I never craved a turkey leg before (I have never had one) and it was all I could think about for an hour or so after walking past a booth selling them. But we moved away from that part of the park, I enjoyed a couple of flavored waters and bites of a benefit bar, and I stayed in the box. I think it is easy to give up your diet when you are on vacation. Your schedule is switched up and you are relaxing. You can justify things because you “deserve” them or it’s a special treat. But what I asked myself was if I were never going to return to Disney World, could I live without ever trying X or Y? And the answer I figured out was that I would be fine. And I am planning my return. 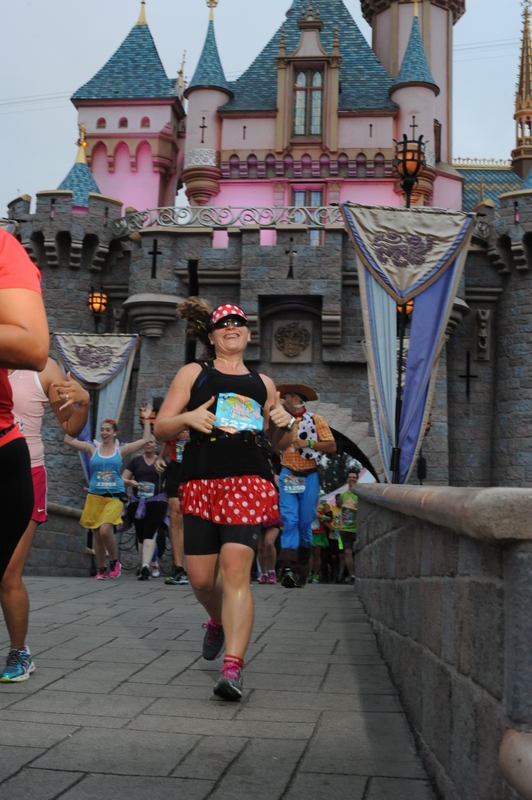 My sister and I are all signed up for the Disney Princess Half Marathon in February! So if that turkey leg still sounds good after running 13.1 miles, I may let myself have a bite. But I will be in control of the food rather than allowing it to control me. I will plan for the food. I will also be in a place by then where I have not only transitioned into Phase Two but I will have lived in Phase Two for several months. I am proud of my success of staying in the box but I also realize my vacation wasn’t ruined by not eating Gap foods. I didn’t need a turkey leg or margarita or mouse-shaped pretzel to complete my experience. This realization has helped me further separate food from my day to day life. Food is fuel and it can be a delicious experience but it is not the whole experience. Now to remember this all as I head into two weeks of travel into major “foodie” cities like New Orleans!